With the recent developments, the role of auditors have been widened and the reliance being placed on their reports have increased. They are invariably called to evidence that they performed their duties with utmost care and in compliance with applicable laws and standards. In such a case only proper and adequate documentation by the auditor can come to his rescue. Hence the need of keeping them updated with the grappling amendments in all the legislations, namely the Companies Act, 2013; Standards of Auditing and Accounting Standards is necessary. 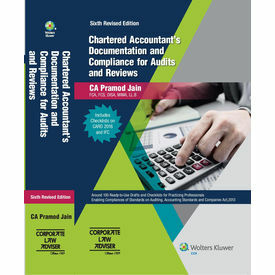 It contains more than 100 drafts, which are ready to be used, for a Practicing Chartered Accountant, during the course of their planning, execution and reporting for various Audits. It also contains drafts of various templates and documents which are required for the maintenance of their resourcing and staffing activities. Around 100 drafts of ready to use documents for day-to-day professional use.